This exceptional grilling tool set from Cuisinart is crafted with precision quality. This 10 Piece Premium Grilling Set includes Grill Tongs, Spatula, Grilling Chef’s Fork, a Grill Brush with two replacement heads and a Set of Four Skewers. 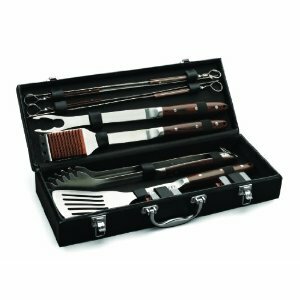 All these come in a Leather Carry Case which makes storing and transporting this Cuisinart Grilling Set a breeze. As you would expect, this Cuisinart 10 Piece Premium Grilling Set is made from high quality Forged Stainless Steel and finished with Pakka Wood Handles for exceptional durability and functionality.